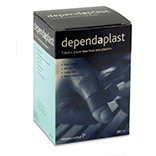 Purchase 50 or more Blue Detectable Plasterss and download your free support pack worth £100. Purchase 200 or more Blue Detectable Plasterss and you can have personalised covers absolutely free! A box of individually wrapped sterile blue detectable plasters. Please allow 3-5 Days order and delivery time.